Bharati Vidyapeeth University Medical College Pune invited us to conduct a one day preconference workshop on Literature Searching & Referencing. This was a day before a Conference – “Healthcare & Research: Building Bridges” – organized by their Research Society. 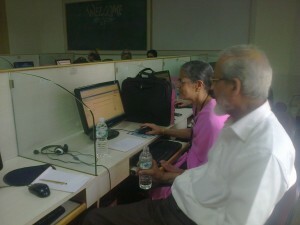 Forty faculty members attended the workshop. For us it was a matter of pride that the Director Health Science, Dr VN Karandikar attended the workshop and shared words of praise and lots of encouragement. Thank you Sir! The program was conducted by Lakshmi, Parvati and Vasumathi and covered PubMed, Cochrane Library & Mendeley for Reference Management. The Principal, Dr Vivek Saoji had a detailed discussion with all of us after the workshop, to explore the possibilities of QMed conducting programs regularly and also helping with certain library activities. Dr Girija Wagh, Dr Jyoti Sharma and Dr Sanjay Lalwani were the organizers and they helped to ensure that the workshop went off smoothly. This entry was posted in 6 - Old posts and tagged Cochrane Library, Mendeley, PubMed, Pune, Reference Management. Bookmark the permalink. Thank you! What we would like is for you not only to “chip away” but ask us when you get stuck – either by email, or even for a short Skype session. We’d like to hand hold you till you get it all right!